Marsh Metrology is now a factory authorized service provider for Mid-West*, Conbraco and Zurn Backflow Test Kits. 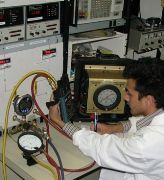 Calibration Statement: Marsh performs a complete evaluation of the test kits including disassembly, cleaning, leak checks on hoses and valves, replacement of worn seals and seats, adjustment & calibration to manufacturer's original specifications and performance of a full pressure test. A certificate traceable to NRC/N.I.S.T. is provided with 'as found' and 'as left' data. In addition we offer an Accredited Calibration Certification to ISO 17025:2017 where applicable. Call us to discuss your calibration needs and service requirements at 1-888-800-2624 x 3027 or email us at info@marshmetrology.com . *Marsh Metrology can also provide Mid-West instrument Backflow Test kits. To download a current brochure click here. To visit the Mid-West Instrument Backflow Test Kit website and see video of typical systems, click here.